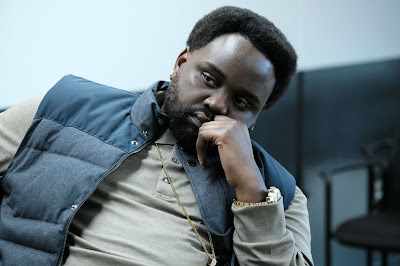 Unlike most sitcoms on television, Atlanta can serve a full-length episode without featuring the protagonist of the series. Although I favor installments that incorporate the entire ensemble, the comedy does not rely on any one character as a crutch. Each cast member possesses the ability to hold their own if necessary. In light of this, 'Barbershop' takes the rest of the characters out of the equation and centers on Alfred's absurd road trip with his barber. At first glance, this story may not sound like anything special. However, the writers add their signature touch and the result is a throughly enjoyable outing. 'Barbershop' begins with Paperboi impatiently waiting to get a haircut. Initially, I expected this scene to last a short amount of time and for the episode to progress to the main event. But, the writers decided to drag it out to last the full twenty-two minutes. While that may sound like a negative response, drawing out the story was the reason that 'Barbershop' worked so well. In addition, the character of Bibby helped the outing reach a level of perfection. Similar to Chris from season 1's The Club, Bibby has a sleazy attitude and takes part in many questionable activities. His vibrant and lively behavior magnificently plays off the furiously despondent Alfred. Furthermore, Bibby's nonchalant reaction to the people he injures and steals from magnifies the amusing nature of his character. Having said that, 'Barbershop doesn't just revolve around Bibby the barber. Paperboi definitely has many moments to shine in the half-hour installment. Alfred's distressed and extremely annoyed mood paralleled how the viewer felt as Bibby continued to stall his haircut. Since none of the cast members are as bouncy and energetic as his barber, this installement gave Al an opportunity to have a great comedic foil. The witty banter between the contrasting personalities helped propel the episode to another level of ingenuity. Outside of the entertaining duo, the side characters also provided their fair share of laughs. Bibby's son Lamar had some priceless interactions with Paperboi and his younger son also had a couple great lines. On top of that, the road trip setup gave Atlanta many unique locations to cover. 'Barbershop was not secluded in a single area and that gave the episode room to use these different places to their full potential. The final scene of the episode acts as a flawless payoff after a lot of frustration. Alfred finding a new barber was a satisfying conclusion to an amazingly reckless outing. But, in a weird way, I almost felt sorry for Bibby. Despite his crimes, his actions never had any malicious intent. After the drab and gloomy 'Helen', 'Barbershop' acted as a delightful counterpart. Jam-packed with jokes and laughs, 'Barbershop' is a thrilling outing with incredible replay value. In all, this would be a great episode to recommend to first-time viewers. It has been two episodes since we've seen Darius. The next episode will change that. Lamar had the audacity to ask Paperboi to put him on. Bibby had the audacity to ask Paperboi for money. Like father, like son. I felt sorry for Bibby. It seemed like he has a hard life. I'm shocked Bibby and Alfred didn't end up in jail. What did you think of 'Barbershop'? What did you think of 'Barbershop'? Leave your thoughts in the comments below.